As I often like to do, we are again taking a drive around the beltway to visit two restaurants. They are only about 20 minutes apart. That means you can have lunch in one and dinner in the other. We’ll start at 7 West Bistro Grille, 7 West Chesapeake Avenue in the heart of Towson. I’ll begin my remarks with this – might be the best lamb chops I have eaten and to be sure there are very good lamb chops being served in area restaurants. Of course, their crab cakes are also excellent, but you’d expect that. The dining area is fairly large but there is also a room for a private meeting or party. 7 West is open seven days for lunch and dinner with a Happy Hour weekdays from 3 to 7 offering half-priced appetizers and drink specials. For you night owls there is a late night Happy Hour Sunday through Thursdays from 9 to 11 with the same deal. Upon entering you’ll find a bar with four TVs. This is where I usually sit. The restaurant is managed by Boyko, one of the best managers I have run across. They do catering both on and off premise, carry out, will valet seven days after 5 and they will validate your parking if you park in two of the nearby garages. Reach them at 410-337-9378 or 7westbistrogrille.com. 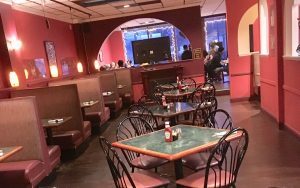 OK, in the car we go and head off to Pikesville and a stop at Al Pacino Cafe, 1330 Reisterstown Road, in the heart of Pikesville. They specialize in middle eastern food but you’ll find much more on the menu. It goes from appetizers, soups, calzones, pizza, pasta, salads to desserts. My favorite dishes are either the chicken or lamb shwarma, though I have been known to order the broccoli with sun-dried tomatoes or the Caesar salad with salmon. The restaurant is owned by Ashraf and Kathy Bakr. Ashraf was born in Egypt so he probably knows a thing or two about middle eastern cuisine. If you eat there you’ll know for sure it’s true. The menu gives you the opportunity to pick your pasta. You select a pasta, a sauce and that comes with a side salad. Give me anything with a red sauce and I’m happy. Al Pacino Cafe offers catering, free parking, a kids menu, a casual and comfortable dining atmosphere, it’s BYOB (and they don’t charge a corking fee), delivery, carry out, open seven days and very good food. Reach them at 410-653-6868 or alpacinopikesville.com. Eddie Applefeld is a Baltimore native and a graduate of Towson University. He has been in the broadcasting profession for over 30 years. Currently he is the Promotions Director of WCBM radio. Before that, he was part of the Rouse & Company show on WQSR, host of a cable TV show called Dining Out and adjunct instructor at Towson. His past accomplishments include being named a finalist in Baltimore Tourism's Employee of the Year Program and winner of Toastmaster's Speaker of the Year contest. He was also twice a heartthrob for the American Heart Association's gala fund raiser. Contact the author.